British Airways, not noted for a frequency of press releases, issued one last week on the 40th anniversary of Concorde’s maiden scheduled flights on 21 January 1976, BA to Bahrain and Air France to Rio de Janeiro via Dakar. The last ever Concorde flight was Heathrow to the then Filton Airport Bristol 23 November 2003. Concorde still holds the record for the fastest crossing of the Atlantic by a civil aircraft (New York to London in 2hrs 52mins 59secs). A long time back Business Travel News suggested that BA rename First Class Concorde Class, but that was never taken up. Much better to tell friends that you have flown Concorde Class rather than First Class (or even Etihad First Apartment). But premium customers can use the Concorde Lounge at Heathrow T5. The good news is that Alpha Bravo, one of seven Concordes operated by British Airways is now being looked after by a new generation of engineers who were still at school when she retired. These apprentice and graduate engineers have learned how to maintain and protect the airframe under the watchful eye of senior engineers and retired Concorde specialists. 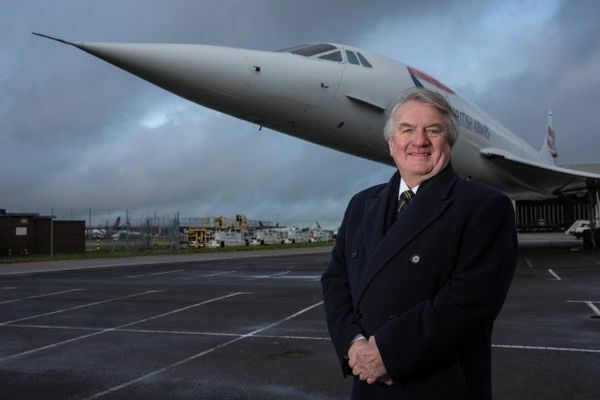 Captain Mike Bannister, former chief Concorde pilot, British Airways, has been to Heathrow to inspect the iconic supersonic aircraft. The BA Concorde fleet now reside at the sites listed. All are prefixed BO for British Overseas Airways Corporations which together with British European Airways became British Airways 1st April 1974. Concorde 002 (Sierra Tango) was the first British Concorde and made its maiden flight on 9 April 1969 from Bristol. She was retired 4 March 1976 when it flew to the Fleet Air Arm Museum at the Royal Naval Air Station Yeovilton. It had made 438 flights (836 hours), of which 196 flights were supersonic. Delta November first flew on 17 December 1971 from Filton and was retired to the Imperial War Museum Duxford 20 August 1977, having made 269 flights (632 hours), of which 168 were supersonic. Delta Golf owned by British Airways but never operated commercially, was the final test aircraft. She last flew on 24 December 1981 after a total of 1282 hours landing at RAF Fairford, and in May/June 2004 moved by road to the Brooklands Museum at Weybridge. Ten aircraft were assembled at Toulouse of which eight remain in various locations.